The quality and flexibility of SPGPrints’ powerful Archer® technology for digital textile printing, featured on a JAVELIN® inkjet printer running live, plus a comprehensive range of inks, will be the highlights of the company’s stand at ShanghaiTex 2017 (booth number W5B60, November 27 – 30, Shanghai New International Exhibition Centre, Shanghai Pudong, PR China). 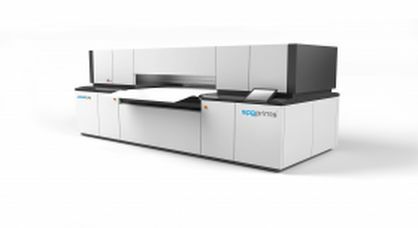 Both printers use SPGPrints’ unique Archer technology, with the company’s own inks developed specially for this technology, as well as Fujifilm Dimatix Samba print heads to fire variable drops of ink (2-10pL) from a distance of up to 4mm on to the substrate. This can achieve a colour gamut that is wider than the high-definition (HD) gamut of other digital textile printing solutions. Adding to SPGPrints’ value proposition, the Archer Print Head Program offers a 2.5-year warranty on print heads, in combination with use of accredited inks, significantly reducing running costs. The JAVELIN is a digital production scanning printer ideal for companies taking the first step into digital printing, or supplementing an existing digital capability. With output up to 367 linear metres per hour, JAVELIN is designed for textile printers requiring up to 2 million linear metres per year. For larger volumes, the SPGPrints PIKE, is a single-pass, high-speed production printer that can print cost-effective long runs. Also highlighted on the stand are SPGPrints’ inks for digital printers using Kyocera print heads. Acid, reactive, disperse and sublimation inks are all manufactured by SPGPrints at its newly expanded 1000m2 ink production facility, located at the company’s Boxmeer (Netherlands) global headquarters. Working in close conjunction with leading print head manufacturers, SPGPrints has developed inks that ensure smooth running, wide colour gamuts, outstanding quality and low maintenance. Information and samples demonstrating SPGPrints’ continued commitment to the conventional rotary screen sector will also be on display and available for inspection. SPGPrints offers high-accuracy and high-productivity screen-imaging solutions to meet the requirements of all textile printers. The SPGPrints bestLEN direct laser engraver can image screens in as little as half an hour without films, chemicals or exposing and washing processes. The smartLEX laser imaging system uses multi-beam diode technology for fast, precise screen imaging. In China, a number of textile printing facilities are benefiting from the fast lead-times, high productivity and extended colour gamut brought by SPGPrints’ inkjet machine systems. Since installing a PIKE printer in July 2017, Dongheng Group (Changzhou, Jiangsu) has been able to meet the high-volume demands of global brand owners, with the ability to offer lead times of less than one week for orders exceeding 100,000 metres. The company is currently producing up to 30,000 metres per day, in one shift, with the PIKE. Several more SPGPrints JAVELIN printers are set to go into production at Chinese textile printers during the final quarter of 2017. With the support of its expanding Chinese subsidiary, SPGPrints Printing Systems Wuxi Co., and the testing and trialling facilities of the new Experience Center at the global headquarters in The Netherlands, SPGPrints is enabling its Chinese customers to transfer smoothly to the Archer technology and gain the most from their investment. SPGPrints is supporting Dongheng with the integration of the PIKE printer into the company’s workflow. The technical training, support and assistance with colour management is enabling Dongheng to supply a major fashion brand. Additionally, SPGPrints’ technical sales team in Boxmeer is providing remote support and consultancy. Denis Jahic (sales manager, digital textile, SPGPrints) comments: “Time to market is most important for gaining business from the global brand owners, and in these situations the single-pass PIKE provides the necessary productivity. As a result of the installation, Dongheng is working closely with a major fast-fashion retailer, enabling it to get large quantities of orders on the market in South East Asia as well as in the United States. “The regional Chinese fashion market is growing fast. They, too, are seeking a similar delivery model of shorter product cycles, and substantial volumes delivered at short notice. Furthermore, with labour costs rising, and stricter government environmental legislations, Chinese manufacturers must find ways to control costs and eliminate waste as well as emissions. The PIKE and JAVELIN printers, with their simple workflows, low manpower requirements and uninterrupted production, are strong propositions to meet these challenges. “In an increasingly service-driven industry, we are committed to providing the highest level of long-term support. Our Wuxi subsidiary has hired new technical and application staff to ensure our growing customer base can achieve maximum uptime, print quality and productivity,” Jahic concluded.